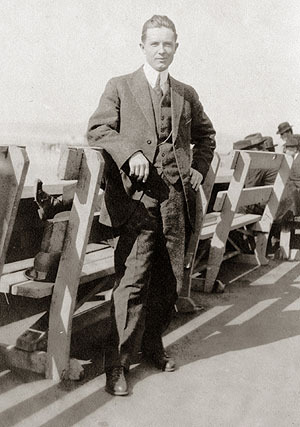 Lucius M Boomer was one of the most well known and successful hoteliers of the early twentieth century. Not only was he the Chairman of the Waldorf-Astoria Hotel Corporation, he owned and managed high end hotels in Washington D. C., Philadelphia, Boston, as-well-as the original and current Waldorf-Astoria in New York City. He was born in New York on August 22, 1878. He managed a number of hotels, and by 1918, at the age of 39, he was president of the Boomer-duPont Properties Corporation, owning and managing the McAlpin and the Claridge Hotels. That year they assumed control and management of the Waldorf-Astoria. 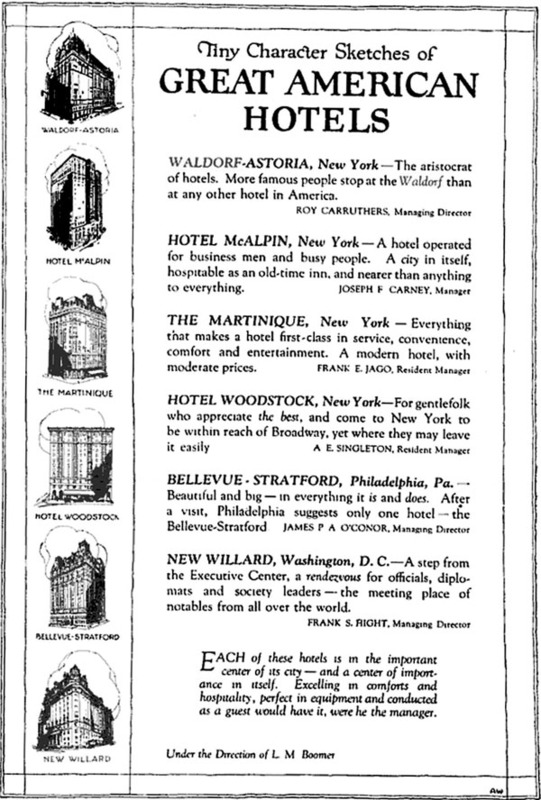 The December, 1922 issue of Hotel Monthly reported, "Mr. Boomer moved his headquarters to the Waldorf-Astoria, which is now the head center of the Hotels System, which include the Waldorf-Astoria and Woodstock Hotels, the Apartments and Cafe Savarin in New York; the Bellevue Stratford in Philadelphia and the Willard in Washington... He continued as a Director for the McAlpin." In 1925 Boomer authored the groundbreaking book "Hotel Management: Principles and Practice" Harper & Brothers, New York and London. was admitted to Columbia University of Physicians and Surgeons in New York City. 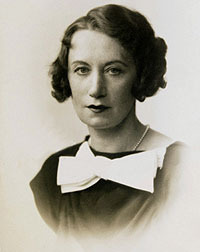 In 1915, she married Richard Sloane, one of the faculty members at Columbia. Six months later she was widowed. In September, 1920 Lucius and Jorgine were married, which became a partnership at the Waldorf-Astoria, he as manager and she as hostess. The original hotel was torn down to make way for the Empire State Building, but the Boomers retained ownership of the name. In 1931 the new Waldorf-Astoria opened on Park Avenue. They became personal friends with many of the residencies and guests of the hotel: Presidents Hoover, Truman and Eisenhower, Benny Goodman, Charlie Chaplin, along with many dignitaries. They were also instrumental in giving Frank Sinatra one of his first gigs. 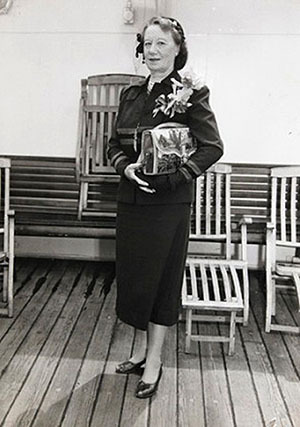 In 1945, Jorgine Boomer served as a technical advisor for the film, "Week-End at the Waldorf", a remake of the original "Grand Hotel," 1932, an adaptation of the Vicki Baum novel "Menschen im Hotel." Full circle. The Boomer property bordered the Arizona Biltmore. She most likely purchased the property because of its proximity to the Biltmore. In 2013, the Arizona Biltmore was acquired by the Waldorf Astoria. 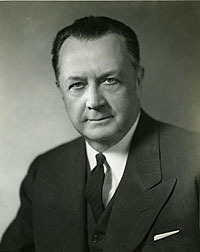 Lucius M. Boomer, State Archives of Florida. Jorgine Boomer. Ad for L. M. Boomer. Hotel Management, December 1922. 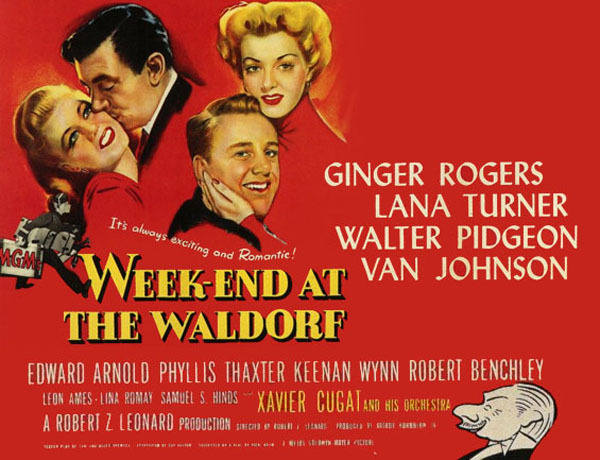 "Week-End at the Waldorf", 1945. Jorgine Boomer served as a technical advisor on the film. 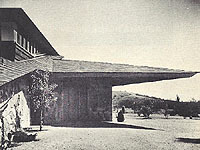 During the early part of 1947, the Boomers contact Frank Lloyd Wright to design a re-build of the Pauson House, his first residential commission in Arizona, which had burned in 1943. But during a trip to Norway in June of 1947, Lucius died suddenly on the 25th from a heart ailment. This left Jorgine in charge of the Waldorf-Astoria. Over the next few years, Jorgine continued to make changes to the Pauson re-design. 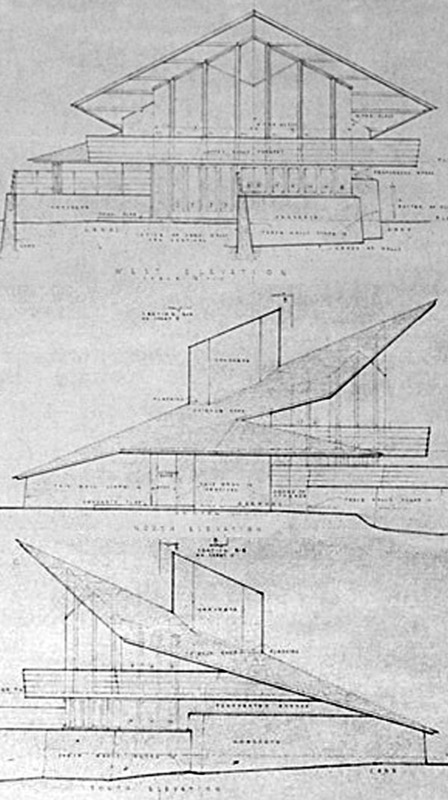 Working drawings were prepared and signed as late as 1952. But she had a change of heart, and decided against rebuilding the home, and purchasing the property from Rose Pauson. 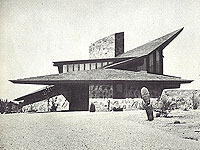 Rose Pauson Residence, Phoenix, AZ, circa 1940, before being destroyed by fire. 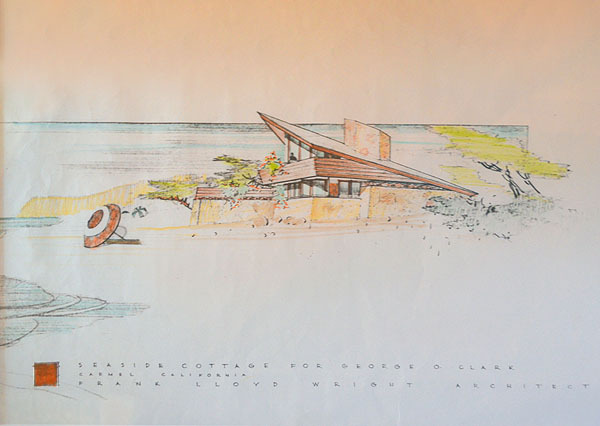 In 1951, Frank Lloyd Wright designed a cottage for George O. Clark, for a site on the beach in Carmel, California. "The name 'Sun Bonnet' was applied to the Clark Cottage after I left the Fellowship. 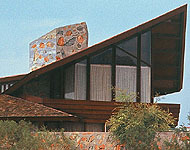 The project was not built and the design later appears as the Boomer Residence in Phoenix (S.361, 1953). 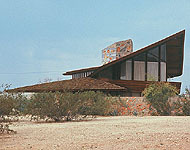 The design was modified to the new client's needs and the house was shaded from the desert sun by its 'bonnet.' Whether derived from a 'whale or of a 'sun bonnet', each project takes a metaphorical approach to organic... It is worth noting that the Clark preliminary drawings were finished while the construction work was being completed for the Unitarian Church (S.291, 1951) at Madison. Did the Unitarian Church design influence the Clark Cottage design? There are similarities. Architecture is evolutionary, with design influenced and refined sequentially from project to project." "Design Through Abstraction," Stricker, Milton,. 2007, pages 49-51. 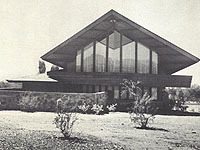 Although the home was never built by George Clark due to lack of funds, two years later it was resurrected by Wright and built as the Jorgine Boomer Residence. "Seaside Cottage for George O. Clark, Carmel, California. Frank Lloyd Wright, Architect. 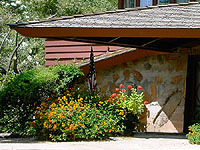 Courtesy of the Frank Lloyd Wright Foundation." "Seaside Cottage Elevations for George O. Clark, Carmel, California. West, North and South Elevations. Frank Lloyd Wright, Architect." Courtesy of the Frank Lloyd Wright Foundation. Elevations. Frank Lloyd Wright, Architect. 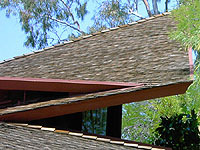 Courtesy of the Frank Lloyd Wright Foundation. Floor plan for the George O. Clark Seaside Cottage, Carmel, California. Adapted by Douglas M. Steiner. The preliminary drawings for the Clark cottage were finished during the completion of the Unitarian Meeting House at Madison. "Desert Cottage for Jorgine Boomer. Frank Lloyd Wright, Architect." Courtesy of the Frank Lloyd Wright Foundation. About the time that Jorgine Boomer opted for a smaller residence instead of rebuilding the Pauson residence, George Clark decided against building his cottage on the Carmel coast. 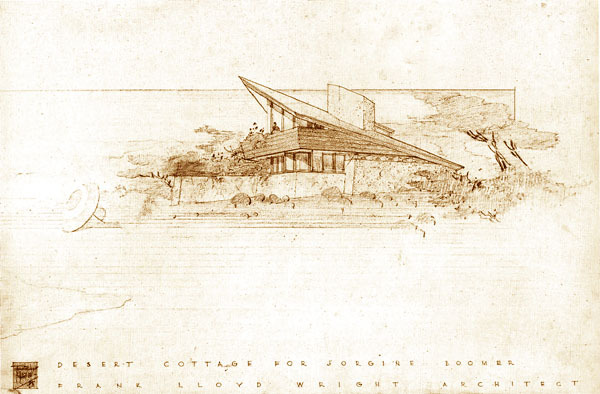 Not to let a good design go to waste, Wright erased Clark's name and replaced it with "Desert Cottage for Jorgine Boomer." He presented the plans to Boomer, and she agreed. He rotated the home 180 degrees, facing Northeast away from the sun's heat, with sweeping views of the Piestewa (Squaw) Peak (yes, it was visible from the property at the time the home was built). 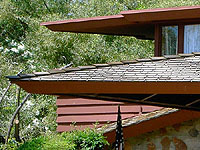 Frank Lloyd Wright wrote, "The Usonian house, then, aims to be a natural performance, one that is integral to site; integral to environment; integral to the life of the inhabitants. A house integral with the nature of materials - wherein glass is used as glass, stone as stone, wood as wood - and all the elements of environment go into and throughout the house." 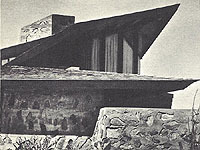 The Natural House, Wright, 1954, p. 134. Perforated light screens, which run along the west side of the home, provide privacy and allow natural light into the Dining Room and Kitchen of the Jorgine Boomer Cottage, Phoenix, Arizona. Adaptation by Douglas M. Steiner. Published in Time Magazine, July 25, 1955. 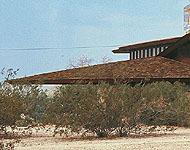 Caption: "Sunbonnet Roof, for comfortable desert living, was designed by Architect Frank Lloyd Wright to protect this Phoenix house from glare and heat." The Benjamin Adelman Residence can be seen in the background. On a trip to Scottsdale during the spring of 2004, we had the opportunity to drive past the Boomer residence and take a few photographs. 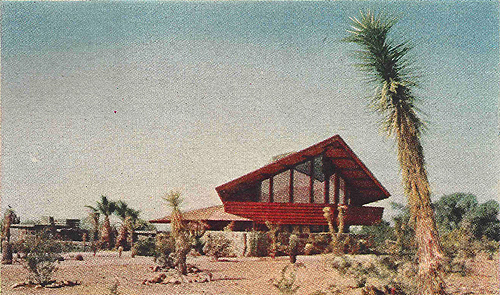 After 50 years, the home appeared to be engulfed by desert foliage which was in full bloom. 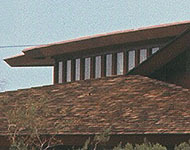 The home is dominated by the large roof that begins in the rear of the home about three to four feet off the ground, and rises to the front, overshadowing the two story home in front, then cantilevers out over the balcony and lanai. My how time flies. It had been ten years since we last visited Scottsdale. This trip had three purposes. The first was to visit our youngest son and his wife, who now lived in the Phoenix area. 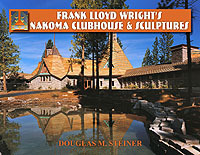 The second was to visit Taliesin West and personally meet and thank those that had assisted us in publishing "Frank Lloyd Wright's Nakoma Clubhouse & Sculptures." 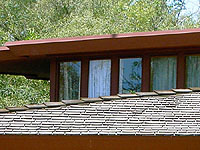 The third was a desire to study and document Frank Lloyd Wright's work. in a more in-depth way then just the cursory drive by, clicking a few quick pictures (like in 2004). We had that opportunity at the Boomer Residence. The nephew of the second and longest owner of the home, he was gracious to allow us not only to closely view the exterior, but also the interior. Text and photographs (unless otherwise noted) by Douglas M. Steiner, Copyright 2014. "Behind the Scenes at the Waldorf-Astoria", Boomer, 1938. "The Waldorf Astoria", Life Magazine, October 8, 1945, pp 99-105. 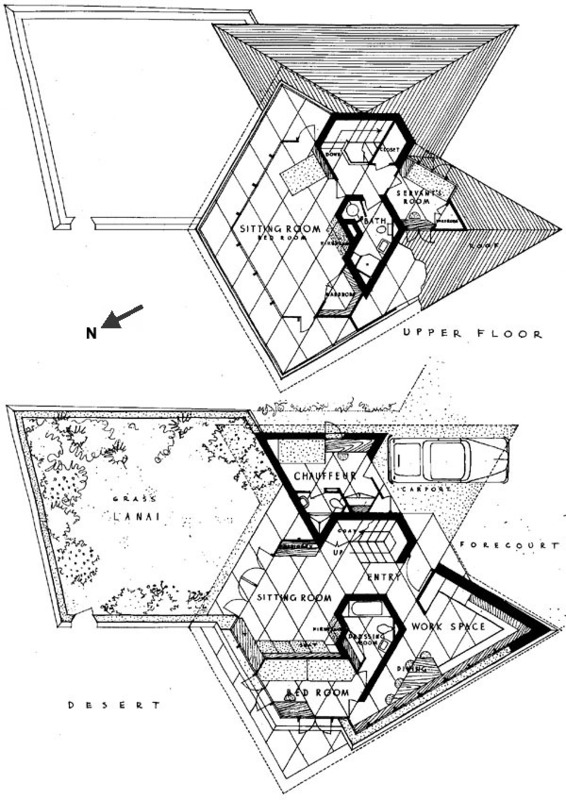 "The Natural House", Wright, 1954. "Arizona Highways", February, 1956, pp 21, 26. 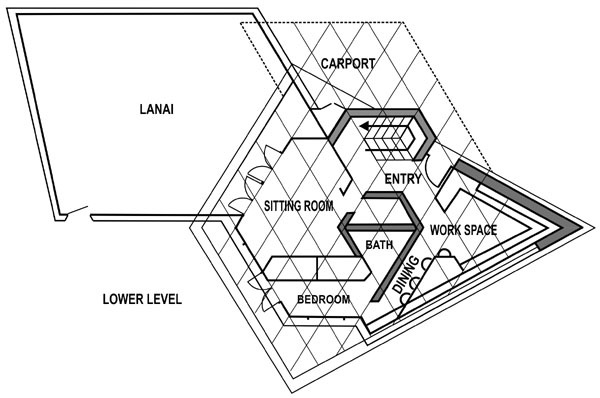 "Global Interior #10: Houses by Frank Lloyd Wright" Futagawa, 1976, pp 148-151. 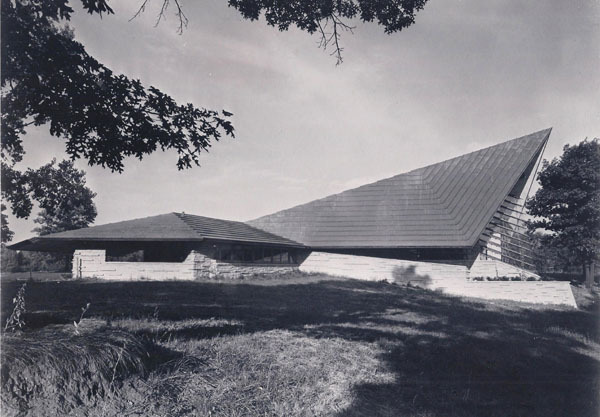 "Frank Lloyd Wright Monograph 1951-1959", Vol. 8, Text: Pfeiffer; Edited and Photographed: Futagawa, 1990, pp 82-84. "Frank Lloyd Wright", Pfeiffer, 1991, pp 166-167. "The Frank Lloyd Wright Companion", Storrer, 1993, p 387. "Frank Lloyd Wright, Field Guide, West Vol 3", Heinz, 1999, p 76. 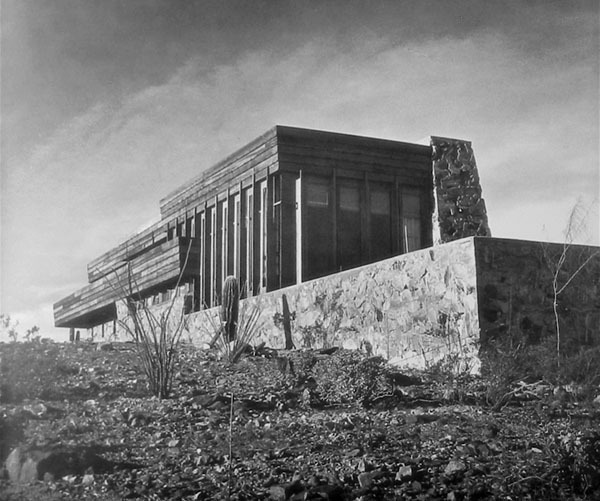 "Frank Lloyd Wright: The Western Work", Legler, 1999, pp 76-81. "Design Through Abstraction, The Wright Source to Art & Architecture", Stricker, 2007. 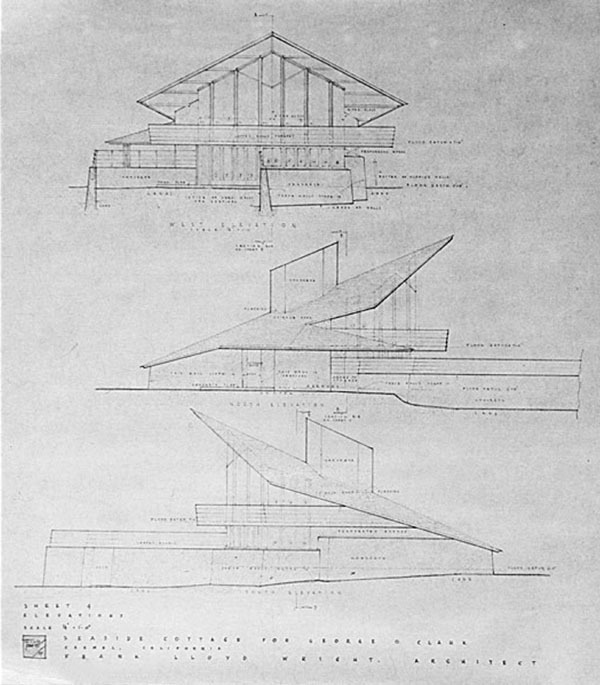 "Frank Lloyd Wright, Complete Works 1943-1959", Pfeiffer; Gossel, 2009, pp 118, 274, 296. "Waldorf Astoria, Images of America", Morrison, 2014.